NaviBlef Daily Care is recommended to be used as daily maintenance care for patients that have followed blepharitis treatment with NaviBlef Intensive Care. 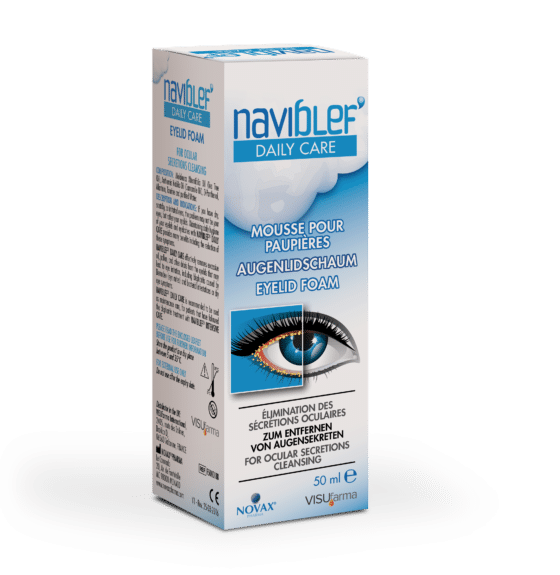 NaviBlef Daily Care is a foam formulation containing Tea Tree Oil for the effective removal of excessive oil, pollen, ocular secretions or other debris from the eyelids that may lead to eye irritation, including blepharitis caused by Demodex and bacterial infestations or dry eye symptoms. NaviBlef Daily Care is a non-greasy and non-irritant formulation, for topical use. NaviBlef Daily Care may be used 2-3 times a day for long-term maintenance of eyelids and eyelashes. See package insert for full instructions for use. NaviBlef Daily Care comes in the form of 50 ml bottle with foam dispenser.